Predatory home loans, like all home mortgages, are increasingly subject to assignment. Now, more than ever before, a market in assignment of loans casts a shadow over how those loans are originated and serviced. While assignment of loans has always been common, relatively new and complex patterns, alternatively referred to as structured finance or securitization, have rendered the assumptions of traditional assignment law quaintly over-generalized. Today mortgage loans, particularly more expensive loans marketed to those with poor credit histories, are likely to be purchased by investment trusts, bundled into large geographically diverse pools with many other loans, and sold as securities to investors. Unlike the law, which has been slow to react to this trend, mortgage lenders, brokers, and servicers now actively bargain with a shrewd eye on the ultimate destination of the loans they facilitate. Many scholars of mortgage lending and secured credit have for the past several years gone about the project of explaining, predicting, and attempting to influence this secondary market in home mortgages. 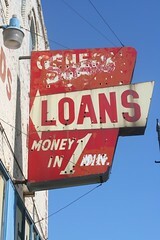 Some have pointed out that lenders no longer “lend” in the sense that they themselves expect repayment. Rather they manufacture a commercial product – borrowers – that are measured, sold, and at times discarded by a consuming capital market. Many of today’s mortgage lenders are assignment production companies that create income streams for the nation’s capital markets. Several scholars have demonstrated significant benefits from this process. Collectively, investors have large amounts of capital, but a limited ability to originate and monitor individual loans. Conversely, mortgage lenders are well situated to make loans, but are typically constrained in the number of loans they can make by their limited access to capital. Provided they can surmount hurdles like trust, information asymmetry, transaction costs, and taxes, these two groups have much to offer each other by way of mutually beneficial exchange. The engineering of securitization conduits is a financial science of overcoming the hurdles separating these two groups. All this is well and good, in that homeowners receive new access to cheap capital, making (other things being equal) home ownership more affordable at the margins. When everything goes according to plan, society has much to gain from securitization of home mortgage loans. But sadly, like many new technologies, securitization comes with a dark side. The contours of this side began to emerge, like so many other consumer problems, in the caseloads of legal aid lawyers serving the working poor. In the late 1980s and early 1990s, legal aid lawyers began seeing growth in the volume of families and senior citizens losing their homes to loan terms and marketing practices removed in degree from theft only ever so slightly by the black magic of boilerplate. Horror stories of breathtaking creditor avarice became common features in newspapers around the country: a seventy-six year-old Georgia widower with monthly mortgage payment in excess of his social security income; a blind Ohio couple duped with a fraudulent appraisal, forged paperwork, and thousands of dollars in kickbacks to a deceitful broker; and, a New York retiree with two amputated legs, $ 472 in monthly social security income, and a $ 424 mortgage payment. For years these stories were dismissed as either anecdotal or impossible, since, after all, Adam Smith’s great invisible hand must inevitably protect consumers through forcing bad actors from the marketplace with the Darwin-like natural selection born of rational, self-interested, autonomous market behavior. Who are you going to believe, the local legal aid lawyer or Adam Smith? Since then, facts have forced a consensus that the term predatory lending – which no longer needs to be surrounded by quotation marks – is real, pervasive, and destructive. A host of empirical studies leaves no serious doubt that predatory mortgage lending is a significant problem for American society. More controversial is this: who should bear the liability for predatory lending practices? Predatory lenders and brokers themselves specialize in maintaining judgment-proof operations. In fact predatory lenders operate on the edge of bankruptcy, quickly folding up and moving on whenever the heat gets close. This is possible because in today’s market, mortgage originators and brokers quickly assign predatory loans through a complex and opaque series of transactions involving nearly a dozen different litigation-savvy companies. Predatory lending victims (as well as courts) are left mystified when each blames the other and no one takes responsibility for unfair commercial practices. Often victims are left asserting predatory lending claims as defenses against a faceless investment trust when it attempts to foreclose on their family home. Universally, the trust claims ignorance of predatory practices committed by other parties to the transaction. This scenario, seen again and again by consumer attorneys all around the country, has forced policy makers to ask whether investors in subprime mortgages have the opportunity and ability to screen their portfolios for predatory practices, and in effect police the behavior of originators, brokers, and servicers. Indeed, this question – should investors be required to monitor lenders for predatory practices – has become the most controversial and important question in the debate over substantive mortgage lending regulatory reform. First, I wiould argues that the concept of predatory lending has been cast too narrowly. I suggest that some of the institutions that sponsor and administer mortgage securitization are complicit in predatory lending. By encouraging, facilitating, and profiting from predatory loans, these financiers have themselves slipped into predation. The notion of “predatory structured finance” is a necessary addendum to the lexicon of predatory lending. A historical argument that structured finance has rendered much of the existing fabric of consumer credit protection law obsolete. Most consumer protection statutes were adopted before Wall Street learned to securitize home mortgages. As a result, the terminology of those statutes frequently leaves predatory home mortgage loans beyond their scope. Developing within these conceptual cracks in the nation’s consumer protection edifice, securitization has allowed much of the subprime mortgage market to evolve unconfined by many of the substantive standards in consumer protection law. A closer look at the history of structured finance reveals that organizational technology has outpaced our consumer protection law, in effect deregulating much of the consumer mortgage market. I would argue that the reform strategy favored by many legislators and a growing number of scholars – assignee liability law – is only a partial solution. Assignee liability rules render the holder of an assigned mortgage loan liable for legal violations made in the origination of the loan. I argue that this strategy, while a necessary component of the law, is by itself inadequate because it excuses many of the most culpable parties from accountability. In addition to limited assignee liability, I would advocates further maturation of an emerging common law trend of using imputed liability theories to hold structured financiers liable for their own predatory behavior. Most all foreclosures in California can be set aside. The power of sale by non judicial means is contained in the civil code 2932. In order to be valid the assignment must be recorded California civil code 2932.5. Most all notices of default recorded by the “Sub-Prime” lenders have not recorded an assignment till just before or just after the Trustee’s sale. They rely on the MERS agency agreement to protect them but under California law they are wrong.